Thirsty skiers and riders will have two new venues to quench their thirst with the new Snowflake White IPA and other choices from local craft brewery Alibi Ale Works. Incline Village, Nev. (Jan. 11, 2019) - Diamond Peak Ski Resort starts off the new year with two new bars featuring a great selection of local craft beers from Incline Village-based Alibi Ale Works, as well as a truly priceless view of Lake Tahoe. 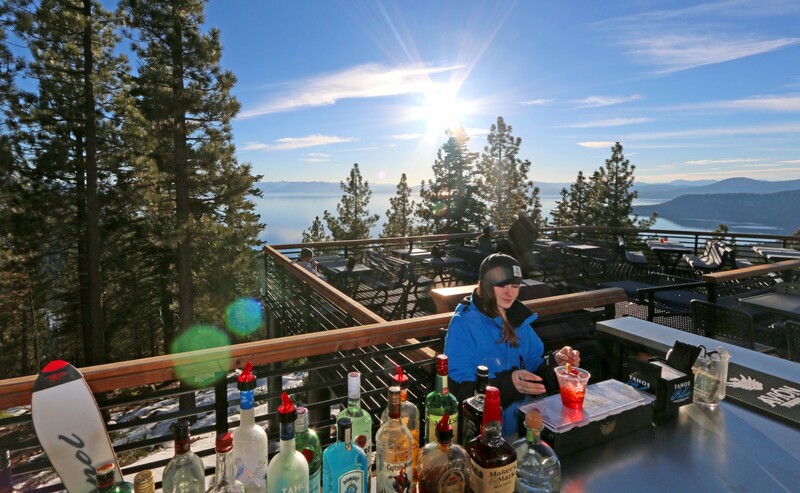 The brand-new Million Dollar View Bar is perched high above the majestic North Shore of Lake Tahoe on the Snowflake Lodge sun deck and offers views of Big Blue that must be seen first-hand to be believed. With multiple beers on tap as well as a large selection of craft and domestic canned beers, specialty cocktails and wines by the glass, the new Million Dollar View Bar is poised to become a must-visit stop on any ski tour of the Lake Tahoe region. Inside at Diamond Peak’s mid-mountain lodge, Alibi Ale Works’ Snowflake White IPA will lead the lineup of eight beers now on tap at the newly renovated Snowflake Lodge indoor bar. Down at the Diamond Peak Base Lodge, the new Alibi Ale Works Pop-Up Bar takes over the space that was the resort’s Lightning Grab & Go window, and offers guests two Alibi beers on tap. “We plan to change up the beer selection throughout the season,” Drake said. “We’ll generally keep one lighter beer like a saison, kölsch or pilsner, and one fuller-flavored beer flowing. Right now we’ve got Saison and Contradiction - our golden mocha “stout” - on tap. Kölsch is coming up next, but Contradiction will likely stick around for a bit since so many people are loving that beer!" With the Alibi Ale Works brewery located just 3 miles from the slopes of Diamond Peak, the brewery plans to bring in a rotating selection of their favorite brews as well as some more experimental options throughout the ski season, so customers should check back often to see what’s on tap. In addition to incredible Alibi beers on tap and in cans, the Alibi Pop-Up Bar will also offer wines by the glass, cocktails, hot chocolate, coffee, tea and sodas, and grab-and-go food items such as chili, clam chowder, hot dogs, sandwiches, chips, candy and snacks. Since 1966, Diamond Peak Ski Resort has been North Lake Tahoe’s hidden gem. Located in Incline Village, Nevada, the affordable, family-friendly resort offers 655 acres and 1,840 vertical feet of skiing and snowboarding, with incredible views of Lake Tahoe, terrain for all levels, and some of the best tree skiing in the Tahoe Basin. For more information or to check the snow report, visit DiamondPeak.com or call (775) 832–1177. Alibi Ale Works is a craft brewery located in Incline Village, Nevada on the North Shore of Lake Tahoe. They produce a wide range of frequently rotating beers with pure Lake Tahoe water, with the goal of keeping their customers’ taste buds intrigued with delicious and well-executed flavors. Alibi maintains a beer line-up that weaves traditional European styles with super-fresh hoppy beers and experimental one-offs that will expand any beer drinker’s horizons. For more information, visit AlibiAleWorks.com. Food and Beverage From the sun deck at Snowflake Lodge to the variety and convenience of the Base Lodge Provisions food court, Diamond peak has many food and beverage options to keep you fueled and hydrated all day long.